I've got to say that I couldn't name all of them but there are plenty of people having a go in the comments!! Typealyzer - what type is your blog? Via my FriendFeed, I was asked by John Johnston (via Twitter!) what type of blog I had, linking to Typealyzer. Being a nosey, inquisitive soul, I decided to find out! And what I found was rather interesting. I'm forever doing quizzes and surveys on Facebook like Which Sesame Street puppet are you? (Zoey) Which Heroes power do you have? (Peter Petrelli) and Which Scrubs character are you? (Elliot) and frankly, whilst amusing, they interest me for about 10 seconds before I move on to poking someone or finding out if I remember the 80s. However, this captured my attention for much longer. I put in my URL as requested and was given the following analysis. And apart from the bit about being impulsive (have to work at that!) and following things through (which I do! ), I'd say it was rather accurate! 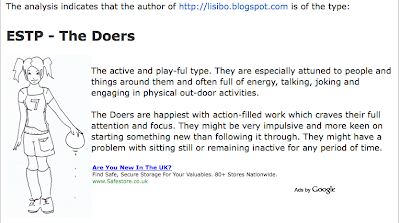 especially the bit about sitting still and remaining inactive! 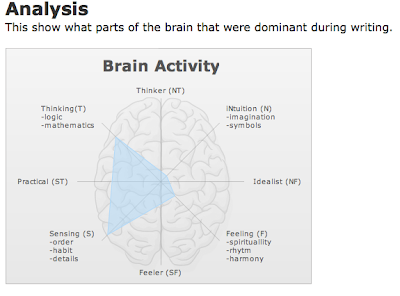 But even more interesting was the next bit which analysed my brain activity. Made me think - why am I so low on feeling, intuition and imagination? I'd say I was that way inclined but my blog doesn't. Perhaps it's the way it's analysed - not sure if it's on the last post or on the whole thing. Perhaps I'll have another go in a week or so and see if it tells me anything different. If you've got a blog, I'd be interested to know what it says about you. I did check a few and discovered that Chris Fuller is a Doer like me, Joe Dale and Oscar Stringer are Guardians, Tim Rylands is a Mechanic, Tom Barrett is a Scientist and Jo Rhys Jones is a Duty Fulfiller. Young Enterprise winners - LanguAges - UPDATE! Some of you may recall a blog post in July about a group from English Martyrs School and Sixth Form College, Hartlepool, winning Company of the Year and Most Creative Company of the Year in the Young Enterprise in the NorthEast sponsored by The Arts Council NorthEast for their product LanguAges. 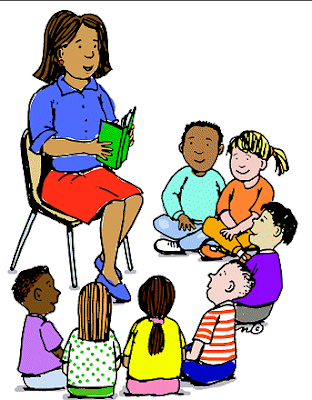 Our company, LanguAges, provides educational resources to aid the teaching and learning of French in primary schools at Key Stage 2. We have created a compilation of three different games, The Clothes Game, The Class Card Game and The Shopping Game, and an Interactive CD, which form the LanguAges Pack. All of our games are tailored to be fun, yet educational, comprehensively covering the Key Stage 2 curriculum, and helping to improve vital comprehension and speaking skills. Having tested the product and marketed it to Stockton schools, all schools in Hartlepool should now have a copy of the materials. We realise that LanguAges has a huge amount of potential, and are currently investigating the many options available to us. 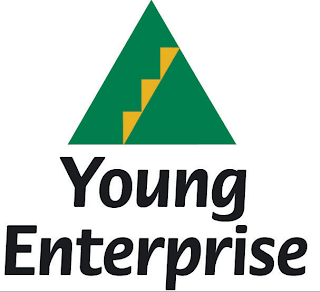 Several possibilities are being considered, such as selling the idea, or even continuing the company even after the Young Enterprise Company Programme is over. The prospect of mass producing the LanguAges Pack and even expanding the range to include a variety of other modern foreign languages is a very exciting one. Today I received news from their (very proud) teacher, Madame Welsh, about LanguAges. An update....they did brilliantly well at the National Finals, winning the Award for Financial Management. They are working with a company http://www.tts-group.co.uk/ to market their product further afield! They make me so proud! So well done once more to the LanguAges team for their continuing success - a great example of language learning going hand in hand with other areas of the curriculum. And a pat on the back to TTS for seeing the potential of the product. TTS is currently one of my favourite school shopping places so I'll be watching out for the arrival of the products! "There has been a growing interest in teaching and learning modern foreign languages at primary level in Europe and research shows how enthusiastic teachers and children are," Georgia Herlt, head of the language department at the Goethe-Institut Dublin, stated. "As well as learning languages it helps with cultural awareness and combats stereotypes, and the children are geared up for it when they go to secondary school." So I'm all for these visits - when a Year2 class told me that they'd worked out from listening to and reading Rubiales on the Northumberland GfL that Spanish put the adjective after the noun whereas English put it before, I was sold on the use of stories to teach! 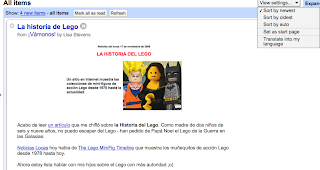 I have been criticised before for 'posting in a foreign language' on ¡Vámonos! 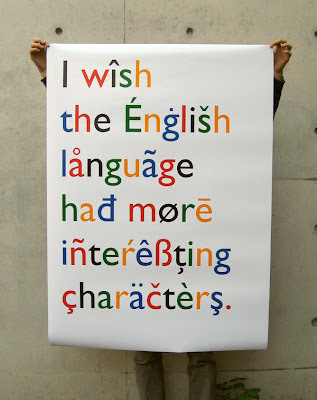 A little harsh, I felt, as the blog is subtitled 'Teaching and learning Primary Languages in the 21st century'. (comment to that effect has been deleted from the post!) However, I am aware that there are readers who do not speak Spanish or Catalan, the two main languages (other than English!) in which I blog. Since its inception, ¡Vámonos! has had a 'translate' widget in the right hand sidebar for just this reason, and I recommended the use of Google Translate last year. 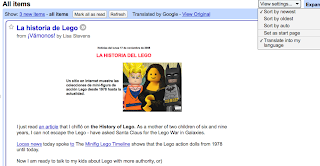 Last week, I discovered that Google Reader now offers the opportunity to have your reading translated into a language that you understand. So, if you have subscribed to my blog using GoogleReader, and didn't understand a word of the previous post, this is for you! The translation isn't perfect - me chifló seems to have it stumped! - but you can get the gist! 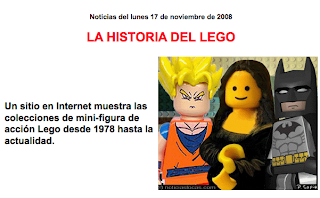 Acabo de leer un artículo que me chifló sobre la Historia del Lego. Como madre de dos niños de seis y nueve años, no puedo escapar del Lego - han pedido de Papá Noel el Lego de la Guerra en las Galaxias. 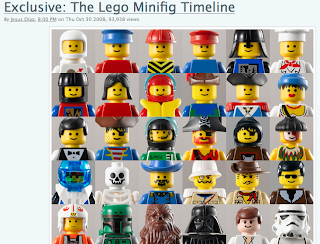 Noticias Locas hoy habla de The Lego MiniFig Timeline que muestra los muñequitos de acción Lego desde 1978 hasta hoy. I first used Animoto during the Voices of the World project last year when we made a short 30 second video featuring pictures that the children had drawn of Spain accompanied by a rather dubious rendition of the Spanish Himno Nacional by most of Key Stage 2. Animoto produces TV-quality music videos using your photos in just minutes. It's so simple to do too. Choose a song as the soundtrack to your video and Animoto will analyze every nuance of it. Producing a totally unique video each time, no two videos are ever the same. I thought it was a good tool then although the limit to 30 seconds for the free vers ion was a little annoying. A while back, I saw it reported that educators could have a free account (saving you $30) and I was sure I'd registered then. However, it seems I hadn't as when I went back today, I didn't have an account. So I rapidly registered and began playing! I'd been reminded of Animoto by a Twitter message saying that you could now add text to Animoto. So, having uploaded lots of pictures of flowers taken in my garden from iPhoto as a test Animoto video and then remixed it, I set about investigating the new facility. I uploaded a set of photos from my Flickr account entitled Spanish food and drink. Next I sorted them a bit so that they were grouped vaguely. My first text screen was the title page, then I added a section title - Tapas and a comments about gazpacho - Me gusta mucho :o) . I then thought I'd make use of a set of pictures to tell a story - a man choosing from the menu and then enjoying his morning break - thanks to my model ;o) I was a little disappointed that you couldn't subtitle the pictures as I'd envisaged making a slideshow to teach food words. However, you could insert a text slide before or after each picture for revision I guess! Having selected a suitable piece of music from the Animoto library, I let Animoto work its magic and voilà - a video that can be emailed, uploaded to Youtube, downloaded and embedded as it is below. If you want to learn more about Animoto, why not check out the site or the case studies section where you can find out how educators have used Animoto in their classroom. I'll be exploring further and will keep you informed of how things go!! Primary Languages Regional Conference - Making the links. Yesterday saw a repeat of the Primary Languages Conference that was held in Coventry in June, this time in Bromsgrove to cover the South of the region. Held in the lovely Bromsgrove Hilton, we were treated to a lovely lunch (always important on a training day!) as well as some great sessions on such things as Numeracy and MFL, Parachute games, Music and MFL and The International Dimension. I delivered a session on Exciting ICT in the PLL Classroom, looking at delicious, Voki, Voicethread and Audacity. As promised, the presentation and notes are below for those who attended and also for those who didn't! Exciting ICT in the PLL classroom. And the day ended with the lovely Steven Fawkes of ALL once more stunning and inspiring us all with his ideas on Performance and Motivation, culminating in the performance of La Banane, a new and innovative take on Kylie's Can't get you out of my head!! This afternoon I had the pleasure of the company of Year 2 for a whole afternoon of Spanish!! So I decided to indulge my creative urges and let them loose with the puppets! This caused great excitement - obviously - perhaps a little more than was strictly necessary, but heigh ho! Below you can see some of the results - some were better than others and, believe me, given the time and effort it took, I'm pleased we recorded anything! Here are my photos from my three day stay in Madrid at the eTwinning conference. Hope you enjoy looking at them as much as I enjoy remembering taking them! DSCN1256, originally uploaded by lisibo. 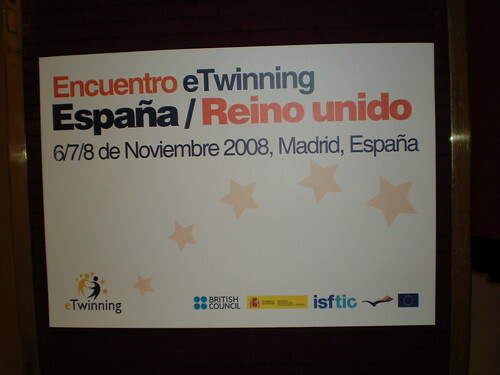 As I mentioned in the previous post, I'm currently in Spain, in Madrid at a bilateral eTwinning meeting for Spanish and English teachers looking for partners - for eTwinning projects. The meeting is coming to an end today after three days of frantic activity as teachers from both countries really threw themselves into the task of making friends and influencing one another. After a treasure hunt around the sites of central Madrid, numerous three course meals and several copas de vino, everyone has found a partner or partners, and begun to formulate project ideas. So it's been a very successful meeting - and some of the project ideas that people are sharing as I type are really interesting and creative! One partnership are going to use digital storytelling and video to share talents between their schools with pupils acting as a Simon Cowell and judging the talents of their partner pupils. Another group are planning on looking at festivals and cultural events along the lines of 'similar but different' - I know that this type of project leads pupils to not only learn about their partners' culture but also to reflect on their own! Another group were inspired to create a NING network in my session (and I only mentioned those in passing!) and are planning on a monthly Voicethread activity about the City of the Future - environment, culture, lifestyle etc. Here's my presentation below - and the notes I made too. As I'm presenting at a British council conference in Madrid this weekend, I've been researching Voki and Voicethread and uses thereof. I'll post my presentation and notes etc after the event, but this particular Voicethread made by Silvia Tolisano aka Langwitches came to mind and I thought I'd share it now as I think it's genius! Basically, there are many photos contributed by people from around the world of something that is particular to their country - could be a tradition, a habit, a routine, a custom - in order to promote intercultural dialogue about our similarities and differences. People are invited to contribute - see the whatcoulditmean wiki for details - by uploading photographs and also by surmising what the photos might mean! A simple idea but great fun and thought provoking too.